Congratulations to the winners of all the recent giveaways we’ve been hosting. Aren’t these awesome? Winners, to collect your prizes, email pr [at] whitneyenglish [dot] com. And a few more giveaways for the road–head over to these blogs to enter! Design Crush – an awesome stationery, calling card, return address label giveaway! The Monogram Swap – a giveaway for a basket of Whitney English initial products! White Thread– another luxurious stationery set giveaway! 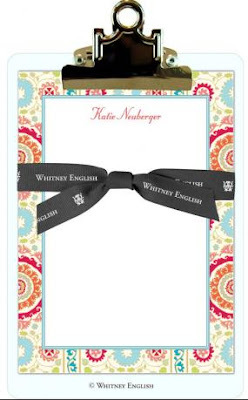 Thanks to KAG over at Monograms & Martinis and Lemon Tree Paperie, we’re offering another fabulous Whitney English giveaway! Head over to visit KAG, leave a comment, and be entered for this giveaway! I stumbled upon this gorgeous tray from Decorative Things the other day. In my opinion, there is no such thing as a house with too many serving trays. If I had my way, there would be a tray on every table and for every purpose! They are great for organizing things. But we’re also big fans of the recent suzani trend as well. In keeping with the style, we designed a note card and note sheet, both of which quickly became best selling designs. In honor of this blog migration, (and who needs a reason, really?) 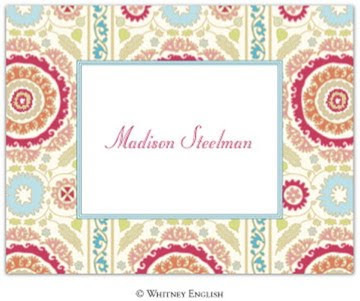 we’re having a GIVEAWAY for a set of Whitney English Suzani Stationery! The winner will receive 25 personalized note cards and a personalized clipboard set! Since the blog giveaway is new territory for us, we’re going to make this super easy: just leave a comment about what future giveaways you think we should host! We’ll select a winner at random on Thursday, October 29th at noon CST! Every year, we start designing Christmas cards for the coming year right about now. And every year, we scrounge for inspiration. And every year, we email our family and friends asking for their favorite photos from that year to use for our samples. Well, this year, we’re going to shake things up a bit. The best part about the debut of our digital photo cards this year has been getting to see all your DARLING children, your funny moments, your handsome families, your summer vacations. Thank you for sharing those with us. Daily, someone hollers across the production room, “Look that that cute kid!” or “That family is precious!” or “Doesn’t she make a gorgeous bride?” Really, you have know idea how adorable you are. So, I’m going to ask you to get involved. Do you have a photo that you don’t mind sharing with us to be used on a sample card next year? If so, here’s the deal. Submit that photo to contest@whitneyenglish.com, with the subject line of “Photo Contest”. Please include your name and contact info in the body of the email. If we use that photo on one of our sample photo card designs, we will send you a gift certificate for 50 Free Photo Cards. You can submit as many photos as you want, and for every photo we use, we’ll send you another gift certificate. And don’t forget the fine print: by submitting a photo, you are authorizing that you the copyright holder, and are granting Whitney English, LLC reproduction rights. Photos must be 300 dpi. No scanned photos, please. You will be notified by email by January 1, 2009 if we will be using one of your photos. If nothing else, thank you for the smiles and laughter you have brought our way so far this season. Thank you for sharing your moments with us–we’ll take good care of them. We promise.